Miles & More celebrates 20 years and WestJet makes our news section for the third day in a row! 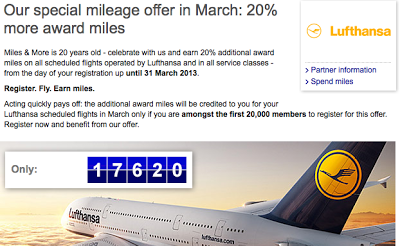 In the bonus offer sections be sure to look into the latest Miles & More promotion celebrating the 20th Anniversary of the program. The 20th Anniversary celebrations will see a different offer each month and this month it is a big one, 20% bonus Miles & More miles on all Lufthansa flights! So if you are planning any LH flights register now as the promotion is limited to the first 20,000 members who sign up for the offer!